I realized that advertisers should incorporate more white space into their ads as I drove for more than four hours today. Many billboards on the highway seem to tie in as much information as possible so that there is no white space left. For me, and many other people, it causes confusion as to what to look at. Rather than seeing "best cheeseburgers in town", I see a 12 x 18 foot white sign littered with words, phone numbers and addresses. There is no direct area for me to focus my concentration — albeit for a matter of seconds. However, a matter of seconds is all that you have in today’s world of messaging. 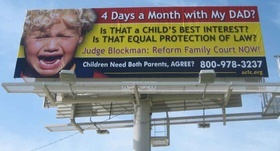 Imagine trying to read this billboard from 75 yards away, going 70 miles per hour. Impossible. The rhetorical question attention grabber is meaningless unless you read the whole ad, which is nearly impossible at even 35 miles per hour. No one will see the web site address in the lower right corner. The Big Deal: I think increased white space would work for advertising mediums as well. Whether it is something as elementary as a flyer or something online like a animated banner ad, advertisers shouldn’t try to cram everything about the business into one small canvas — it creates confusion and doesn’t necessarily engage the viewer. Like presentation slides, billboards should utilize graphics, logos and minimal text convey the message. Make the emotional appeal through the image, tie it to your brand through the logo and state your claim using less than 10 words if possible.